PRINCETON, N.J. -- On the eve of Christmas 2015, a review of over 174,000 interviews conducted in 2015 shows that three-quarters of American adults identify with a Christian religion, little changed from 2014, but down from 80% eight years ago. About 5% of Americans identify with a non-Christian religion, while 20% have no formal religious identification, which is up five percentage points since 2008. These results are based on interviews conducted each year since 2008 as part of Gallup Daily tracking. 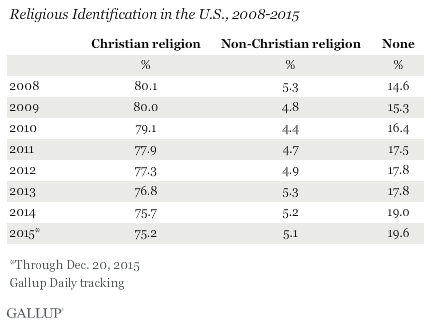 The general trends in the data over this eight-year period are clear: As the percentage of Americans identifying with a Christian religion has decreased, the percentage with no formal religious identification has increased. The small percentage of Americans who identify with a non-Christian religion has been essentially constant over this time period. The downtick in the percentage of the U.S. population identifying as Christian over the past eight years is a continuation of a trend that has been evident for decades. 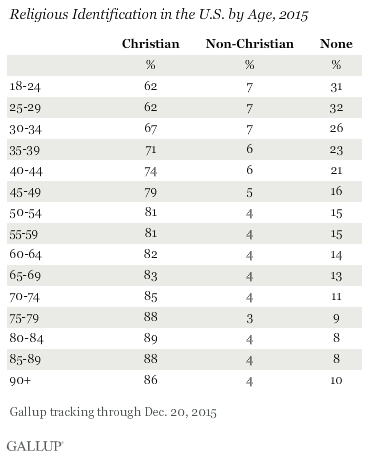 In Gallup surveys in the 1950s, over 90% of the adult population identified as Christian, with only a small percentage claiming no religious identification at all or identifying with a non-Christian religion. Despite these changes, America remains a predominantly Christian nation, and with 94% of those who identify with a religion saying they are Christian. The broad Christian category includes Catholics, Protestants, Mormons and non-denominational Christians. In 2015, 24% of Americans identify as Catholic, 50% as Protestant or as members of another non-Catholic Christian religion, and 2% as Mormon. The percentage of Christians is highest among older Americans and decreases with each progressively younger age group. This trend reflects the high number of "nones" -- those without a formal religious identity -- in the younger generations, as well as a higher proportion of non-Christians among them. One key to the future of Christian representation in the U.S. population will be shifts in the religious identification of today's youngest cohorts. Traditionally, Americans have become more likely to identify with a religion as they age through their 30s and 40s and get married and have children. If this pattern does not occur in the same way it has in the past, the percentage of Christians nationwide will likely continue to shrink. America remains a predominantly Christian nation, with three-quarters of all adults identifying with a Christian faith, and with over 90% Christian representation among those who say they are a member of any kind of religion. A major religious trend in the U.S., however, has been the increasing number of Americans who say they do not have a formal religious identification. This expansion has been accompanied by the shrinkage in the number of people who identify as Christian. More than 95% of Americans identified as Christian in the 1950s, and 80% did so as recently as eight years ago. While the 5% of the population who identify with a non-Christian faith is higher than it was decades ago, it has not shown significant change over the past eight years. Results for this Gallup poll are based on telephone interviews conducted from 2008-2015 on the Gallup U.S. Daily survey, with random samples of adults, aged 18 and older, living in all 50 U.S. states and the District of Columbia. The sample sizes of those interviewed were over 350,000 for the years 2008 through 2012, and over 170,000 for the years 2013 through 2015. The 2015 sample consists of interviews conducted through Dec. 20, 2015. For results based on the total sample of national adults for each year, the margin of sampling error is ±1 percentage point at the 95% confidence level. All reported margins of sampling error include computed design effects for weighting. Each sample of national adults includes both cellphone respondents and landline respondents, with the percentage of each varying across the eight years included in this analysis. Landline and cellular telephone numbers are selected using random-digit-dial methods. Pope Francis enjoyed a double-digit boost in favorability after his September visit to the U.S. Seventy percent of Americans rate the pope positively -- up from 59% in July. The latest rating is still lower than the 76% in early 2014.